Ryan Manning (pictured below), MediaCom’s 25-year-old content distribution director, has just spent a week in Cannes. Here’s his take on the week’s best bits, the outtakes and the highlights.. I was lucky enough to be sent to Cannes Lions this year. My first time to travel to the Riviera, I had no idea what to expect. I was totally blown away, beyond the rosé and tiny dogs (they really are tiny), it was the most inspirational week of my career. Cannes for me felt more like a tech conference than a marketing one at times. I loved this and learnt so much about new ways to connect with audiences through technology. There seemed to be a clear division between the people that loved this and people that hated it. I have seen lots of reviews and opinion pieces (typically from people who have been in the industry for a long time) that this festival is less and less about marketing and creativity. I personally loved that the tech was on display, creativity through technology is one of the most exciting opportunities for agencies and brands. AI will be have a drastic impact to the way we search for information. If you and your brands don’t understand it, how can you use it? Go and buy one.. Your business probably spends thousands on training, how about $200 on the future of search? The Internet Of Things was a hot topic at Cannes this year, we are yet to see too many executions winning awards but the IOT is on the radar of the most inspirational people in the industry. The evolution of the Internet Of Things looks to become the Internet Of Me. This concept of a connected and hyper-personalised ecosystem of digital and physical things brings with it the ultimate opportunity in one-to-one brand communication. VR was just as massive as I expected it to be. Loads of award winning work, and loads of discussion. 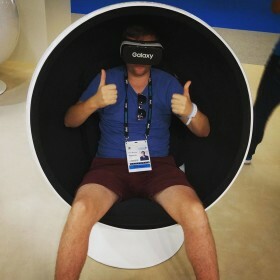 The Samsung VR roller coaster – Taking the VR world and combining it with a physical experience to match takes this technology to the next level. The New York Times took away the Grand Prix in the innovation and storytelling category for their VR experience The Displaced. Field trip to Mars – VR experience with no goggles! It became quite clear that there is a battle of the yachts in Cannes. This year there were about 20 adtech Yachts Vs News and Daily Mail in their mega yachts at the end. This war of traditional media vs adtech was a real theme throughout the festival. Programmatic in particular was a bloody battlefield, everyone loves the technology but there is vast difference of opinion as to how powerful it really is. My core takeout was that the technology is awesome, you can reach people like never before but you still need to talk to people. Sell to robots, talk to people. Data was another hot topic, there were many facets to the data battle including measurement, quality control and data sources but the topic that caused the most conversation was data and creativity. For me it is clear that the creative process needs to be revolutionised to utilise the wealth of information we now have available. Creatives are worried and I don’t blame them, we need to use data to power creativity not prevent it. A number of very interesting talks spoke about how people access content and the way it is changing. Traditional forms of content discovery such as newspapers and magazines went head to head with algorithmic discovery such as search and social. Flipbook CEO Mike McCue took a strong stance on this with his core argument revolving around the art of curation and showing people things they may have never considered looking at. My opinion is that curation and algorthims can live side by side. It’s the individual’s intent and state of mind that should define which takes dominance. I felt this topic to be very important, as we move into a world of content overload, how do we know what to show who? I expected that this festival would be used as a forum to try and combat the impact of ad blocking across the industry. I might have missed the wrong talks but I felt like it was a bit taboo. If we are going to stop people blocking ads, here are three things I think the industry needs to do. Talk about it – use these events to work together and fix it. Share the responsibility – brands need to have confidence in content, agencies need to make better ads, and publishers need to say no to bad ones! Tell people we are doing something – explain to people they don’t need to block ads anymore. People block ads because the ads are annoying – let’s just make them better?